Combining ice sheet modelling with geological, oceanographic and climatic data to understand the dynamics and history of the northwestern part of the Greenland Ice Sheet. Trial lecture: Past, present and future sea-level changes in the context of regional and global ice dynamics (5 Dec 2017). 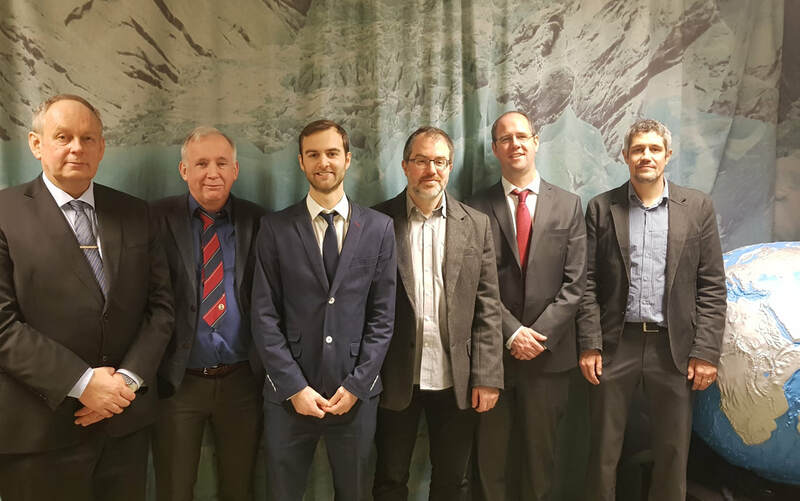 From left: Atle Nesje (member of evaluation committee), John Inge Svendsen (co-supervisor), the new doctor Henning Åkesson, Kerim H. Nisancioglu (main supervisor), Chris R. Stokes (opponent), Andreas Vieli (opponent). Not in picture: Mathieu Morlighem (co-supervisor). The rise and fall (?) of Hardangerjøkulen ice cap, southern Norway - what happened in the past, and what does the future hold? (video link). The Norwegian fjord landscape conceals abundant clues of the behaviour of glaciers of the past, and how fast they melted away. In his PhD thesis, Henning Åkesson shows that the glaciers in western Norway during the last glacial period were extremely sensitive to climate change. Similarly, the glaciers currently present in the Norwegian landscape are also about to melt away. Åkesson used computer models and geologic evidence to study glaciers of the present-day and the last glacial period in Norway and Greenland. The thesis closely examines Norway’s sixth largest glacier; Hardangerjøkulen ice cap. Today’s ice cap does not consist of ice remaining from the last glacial period, but was built up over the last several thousand years. Åkesson shows that this ice cap is exceptionally sensitive to a warmer climate. Melting of Hardangerjøkulen brings challenges to the hydropower and tourism industry alike. Plants and animals living in the vicinity of the glacier are also forced to adapt to a changing landscape and waning meltwater from the glacier. The thesis also considers the glaciers of coastal western Norway during the last glacial period. These ‘fjord glaciers’ are particularly vulnerable to climate change, since a warming atmosphere and ocean melt the ice from both above and below. The glaciers that once dominated the Norwegian fjord landscape are close cousins to the glaciers that today inhabit the fringes of the Greenland Ice Sheet – glaciers that now are melting at an increasing rate. The fjord glaciers in western Norway melted away around 11,000 years ago; when will this happen to their cousins in Greenland? Glaciers melt in a warming climate, but they follow different patterns. Some glaciers are immensely sensitive, while others still are stable over long periods of time, before suddenly retreating rapidly in response to a warming. This knowledge is vital when we seek to understand how climate change affects our glaciers. Åkesson’s work shows that predictions of ice sheet melt in Greenland and Antarctica, with associated sea level rise, can be improved by studying the glaciers covering the Norwegian coast during the last glacial period. 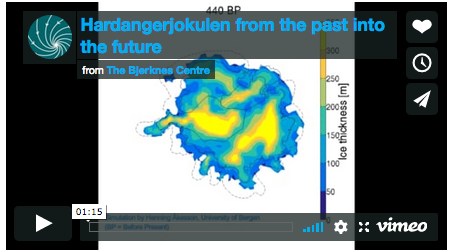 When it comes to Hardangerjøkulen, this ice cap will likely melt away completely before the end of the 21st century, should the current warming continue. My PhD project was a part of the EISCLIM project, which focused on the style of growth and decay of the Eurasian ice sheet, and what forcings were responsible for these changes. EISCLIM comprised geological reconstructions and modelling of climate and ice dynamics on both the ice sheet wide and regional scales. Key partners in this project were Kerim H. Nisancioglu, John Inge Svendsen, Jan Mangerud, Anna Hughes, Kristian Vasskog, Jostein Bakke (all University of Bergen and Bjerknes Centre for Climate Research), Lev Tarasov (Memorial University of New Foundland), Nina Kirchner, Richard Gyllencreutz (both Stockholm University), Faezeh Nick (University centre in Svalbard), Jason Briner (State University of New York at Buffalo) and Brent Goehring (Purdue University). EISCLIM was funded by the Norwegian Research Council. Modelled ice sheet geometry at (a) 15 ka, (b) 14 ka, (c) 13 ka (Allerød), and (d) 12 ka (Younger Dryas). For each time-slice, red solid and dotted lines represent maximum and minimum extent from geological reconstructions (Briner et al., 2014; Hughes et al., 2016; Gump et al., 2017; Mangerud et al., 2017). Melting glaciers and ice sheets are perhaps the most visible signs of a warming climate. Glaciers are retreating on every continent, ice sheets are shedding icebergs into a warming ocean at an accelerating rate, and the atmosphere melts more ice as temperatures rise. Despite these lines of evidence, and a growing scientific and public attention to melting ice; we are still not able to present robust numbers of future sea level rise. observations reveal that neighbouring glaciers respond differently to the same climate warming. Caution is therefore needed when explaining the responses of these glaciers. the overarching question: how do glaciers and ice sheets respond to climate change? 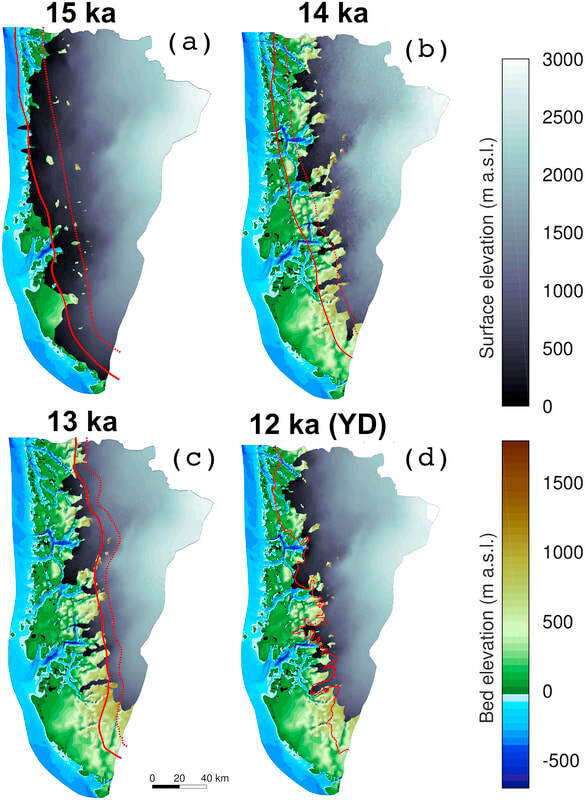 the Norwegian fjords in Paper V.
For marine-terminating glaciers, we find that grounding line dynamics and ice-ocean interactions are fundamental over time scales up to a century or two. Beyond this time frame, changes to the surface mass balance are likely to drive widespread, multi-centennial to millennial scale deglaciation. Based on the results presented in this thesis, we also suggest that topography is a factor that cannot be ignored. 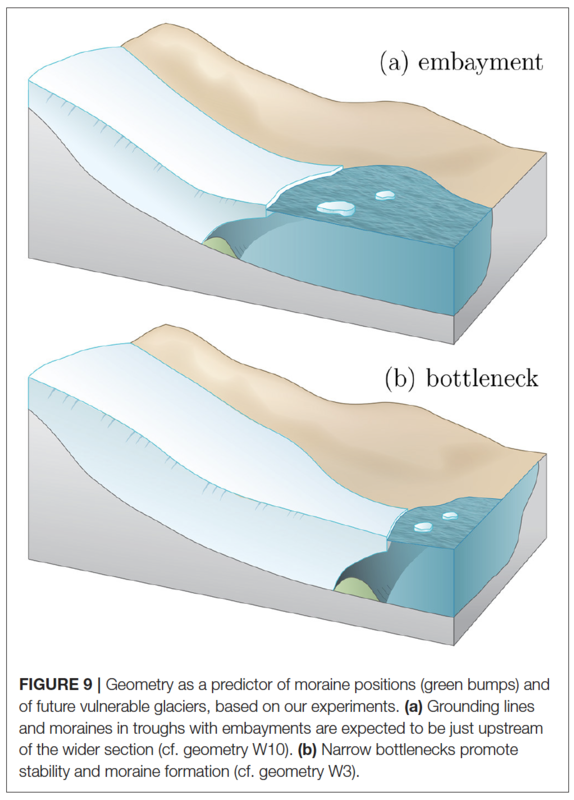 Once triggered, the response to climate change is to a large degree controlled by the underlying bed topography of ice caps (Paper I), and by the fjord bathymetry and width of marine-terminating glaciers (Papers II–V). The implications are that continued intense studies of warming seas around Greenland and Antarctica are justified, but also that assessments of atmospheric-induced melt will be important to estimate long-term sea level change. The striking impact of topographic factors found in this thesis also shows a potential to use geometry to predict future evolution and estimate past retreat and advance. Model mesh used to model Hardangerjøkulen ice cap. Colours indicate present-day ice thickness, the solid line represent present-day ice margin and the dashed line the flowline of the largest outlet glacier, Rembesdalskåka. 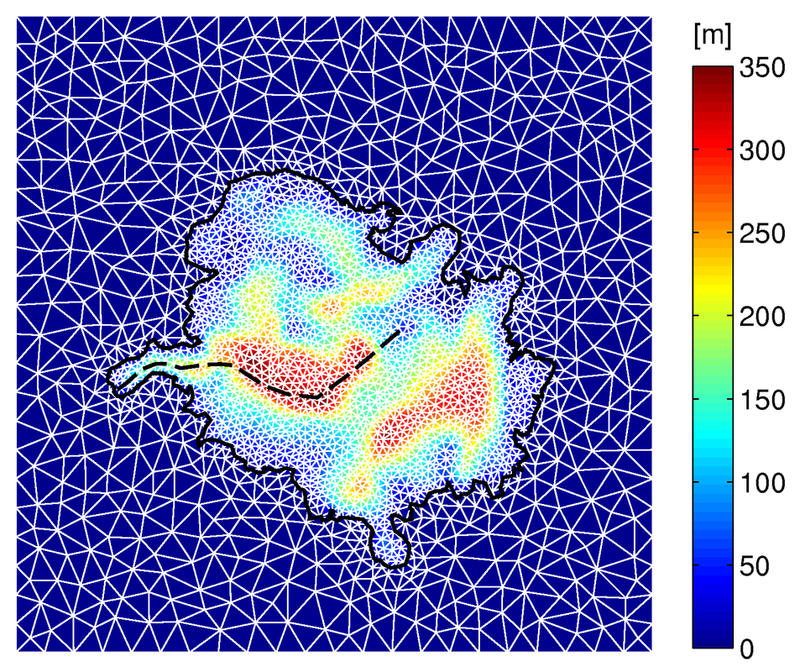 I was using a numerical ice flow model (the Ice Sheet System Model, ISSM; Larour et al. 2012) to understand the climatic response and dynamics of the Hardangerjøkulen ice cap (73 km2) in southern Norway during the last 300 years. I investigated the effeect of sliding parameterizations and the applicability of the Shallow Ice Approximation for small ice masses. 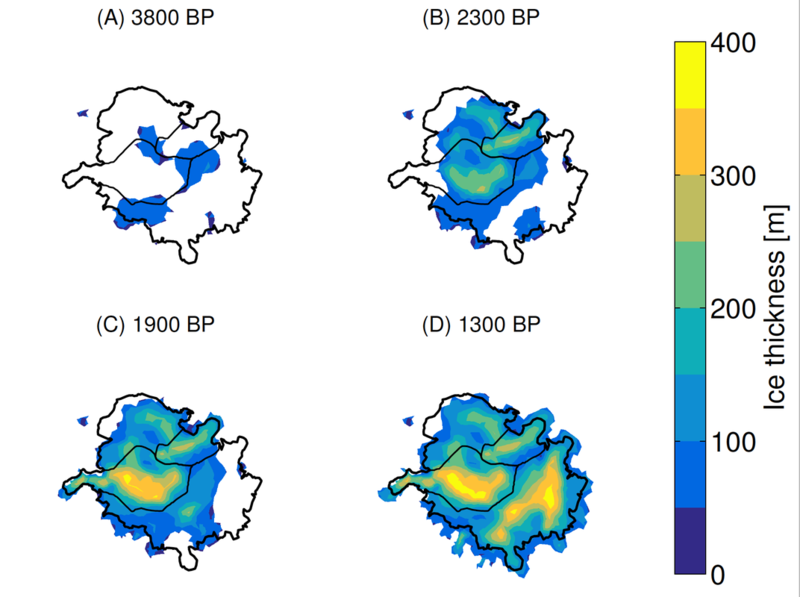 Using in incomplete description of ice flow, along with a simple implementation of mass balance, we were able to reproduce most of the observed and reconstructed glacier evolution from the Little Ice Age maximum in 1750 until today. We also found that the present-day Hardangerjøkulen ice cap is very sensitive to changes in mass balance. A shift in mass balance with only - 0.15 m water equivalents relative to the mean mass balance during the last 45 years will cause almost the entire ice cap to disappear. This thesis was defended 11 June 2014 and graded A (scale A-F). Larour, E., Seroussi, H., Morlighem, M., & Rignot, E. (2012). Continental scale, high order, high spatial resolution, ice sheet modeling using the Ice Sheet System Model (ISSM). Journal of Geophysical Research: Earth Surface (2003–2012), 117(F1).